When you think of cocoa butter, you may think of chocolate, as both are extracted from the cocoa bean, and this same oil is what gives chocolate a silky, smooth taste as it melts in your mouth. Cocoa beans are native to South American countries and have been grown to make natural skin care products for hundreds of years. The oil or butter that is extracted from it is very emollient and hydrating, which makes it a very popular ingredient in many skin care products around the world. It is considered a healthy fat, just like coconut oil, and if it is pure cocoa butter, it will often contain the same healthy oils as the cocoa bean itself. 2. Helps repair aging skin - with it's polyphenol compounds, cocoa butter helps fight sagging, wrinkles and aging skin plus control degeneration of skin by improving skin tone and elastisity. 3. Treatment for skin burns - replenishes,, hydrates and helps skin actuily helps heal from burns, cracks, peeling, and eczema. 4. Heals Chapped Lips - because cocoa butter is an emollient, it is one of the most popular ingredients in lip balms and chap sticks, which hydrates your lips and blocks damaging cold temperatures and sun rays. 5. 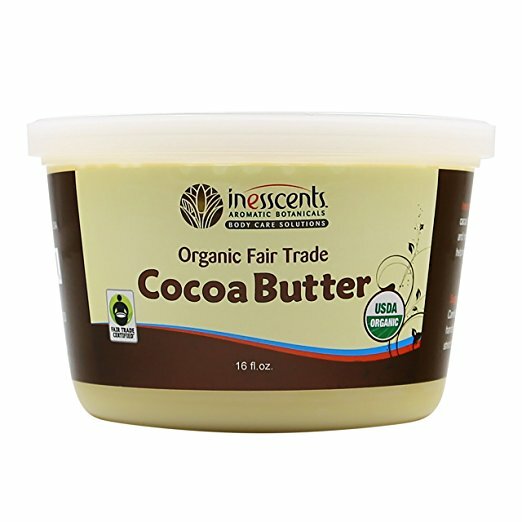 Boosts Immunity - because the polyphenols in cocoa butter have antioxident properties, it actually helps fight inflammation, cell damage, and disease. When used instead of vegetable oils, it may reduce inflammation, balance hormones, and promote healthy brain function. 6. Improves Heart Health - plant-based saturated fats are beneficial in reducing heart disease and promoting overall good heart health, decreasing the risk for heart attack. 7. Help heal burns, rashes, and infections - pure cocoa butter (without fragrance, perfume or alcohol) can help replenish skin after damage. Most known for it's ability to treat or prevent stretch marks during pregnancy, cocoa butter benefits for skin, especially if the skin is dry, cracked or chapped is it's most widely scientifically proven result. Read more about Uses and Benefits of Cocoa Butter.